The fourth labyrinth is located far to the north. You must pass through the swamps above the desert and climb the mountains. 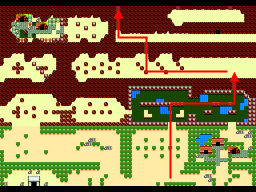 Follow the arrows on the left picture to get there. 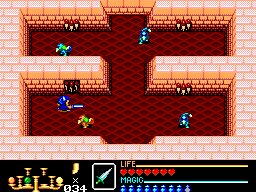 There are several enemies on the way so it's best to rest in Kari-Kari, the desert town, before venturing there. 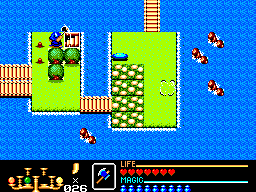 Once you get to the third islet, cut the trees near shore and a save point will appear. Save your game before proceeding. The fourth labyrinth is just ahead, follow the bridges and enter the labyrinth. Enter the right door and kill all enemies. Pick the key and go up. 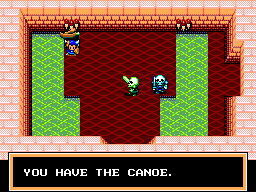 Again you'll encounter some monsters, but you don't need to kill them. Killing them will open the shut door but there's nothing on the left room, only some fires. Break the right brick with the Earth Magic and a passage will open. Once you get to a room full of bizarians, push the left torch and again a passage will appear (yes, it keeps getting harder and harder). The red ones can be troublesome because they keep following you. Try the Earth Magic against them if you get cornered. 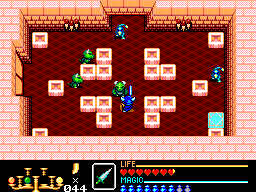 In the next room, kill all enemies then destroy the left brick and push the left torch on the wall. Enter the top door, kill all monsters and grab the key. Then go back and enter the door to the right. 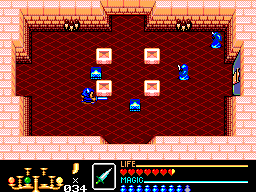 In the next room, you have to be careful with the four blocks in the middle, they're ambushing monsters. Enter the top door, kill all enemies and grab the key afterwards. Go back and unlock the right door. You should still have two keys left. You should be now at a room with two statues in the middle. Don't open the locked door yet, go down and push the left torch to open the shut door on the left then enter it and kill monsters if they get in the way, but it's not needed. 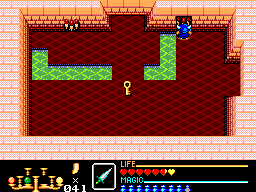 Push the right torch on the wall and a key will appear. Now go back to the statues room and open the locked door. Finally something good! Open the chest and you'll find the Canoe. With it, you'll be able to cross shallow waters. Enter the door to the right. 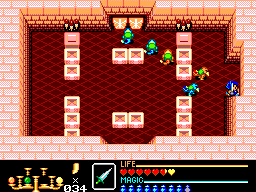 Destroy the brick at the end of the room and a warp will be revealed. Move onto the warp to continue. Kill all monsters then go up. Again, kill all monsters to get a key. Go back to the first room and enter the left door and AGAIN kill every enemy. When the shut door opens, enter it. Finally you'll be at the last room. Behind the locked door is the boss. 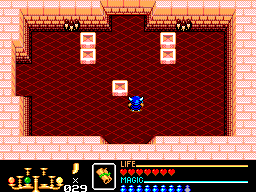 Before going in, make sure you have at least 3 life points and enough magic to cast Thunder Magic a few dozens of times. That should do it. 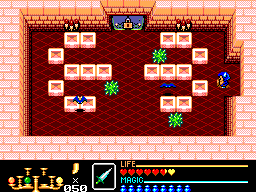 To beat it, just keep a distance between him and when he appears shoot the Thunder Magic. 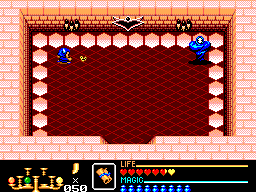 This boss doesn't shoot or chases after you so it should be fairly easy to defeat him given you have enough magic. 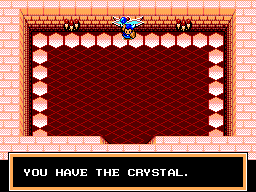 At last, get the blue crystal. 4 down, 6 more to go!